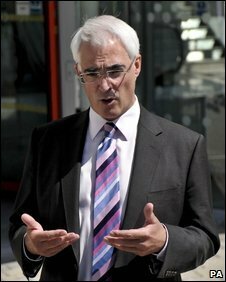 Mr Darling called on regulators to be "vigilant"
It would be "disastrous" for bankers if they returned to their old ways and repeated past mistakes, Chancellor Alistair Darling has warned. As reports suggest a return of the City bonus culture, Mr Darling said some people there were too complacent and needed "to be brought back to Earth". He told the Independent that ministers would not legislate to cap bonuses. But he said it would give regulators more power to intervene if firms offer rewards that encourage risky behaviour. "There are people who are too complacent in my view," Mr Darling said. "Some (banks) are only operating at all because of very substantial support from taxpayers, who are entitled to tell the government we must not repeat the mistakes. "If they go back to the way they were - to business as usual - without asking themselves over and over again whether they understand what they are doing, that would be disastrous for them and the rest of the world." There are reports that "bonuses are back" is a catchphrase emerging in the City. Mr Darling said the City watchdog, the Financial Services Authority (FSA) would get greater powers to intervene if companies offered rewards which encouraged risky behaviour. Banks could be forced to hold more capital to provide a safety net, he added. Meanwhile, the Bank of England is expected to be given a key role in assessing risk to the system as well as individual banks. Furthermore, it will be handed the task of preventing future booms from turning into bubbles. The chancellor played down suggestions of a power struggle between the FSA and the Bank of England, saying "it's not a turf war". But he called on regulators to "put people on the rack and ask some pretty tough questions". Mr Darling said regulators needed to be "vigilant about the risks" and called on bankers to thoroughly question the decisions they were taking.